– With your pores opened by using the hair steam machine, evenly apply the product to your scalp with a thick cotton swabmoistened with the product after taking about 7ml from this product container using the pipette, Scrub and wipe the product around the pores. Remove contamination and dead skin from scalp and follicles. Betaine and glycerol, a natural moisturizing factor derived from natures, will continue to cultivate your skin to be moist by keeping your moisture-scarce scalp moist. The product has an excellent adsorption capacity when applied to the scalp, and the moisture shield of your skin's surface is further enhanced. Betaine, a natural amino acid component extracted from sugar cane, supply moisture to the scalp, and furthermore, a synergy effect with glycerine will form a more powerful skin shield that will make your skin moist. Because the product contains allantoin, a natural stimulus extracted from plants, to make your unleashed and rough skin emollient and moisturized, it can soothe your skin faster. As extracts from 12 kinds of plants, such as Morus bark, rosemary, lavender, etc, in combination can affect your skin, the product minimizes skin irritation. The juice of the California certified organic aloe vera, excellent in the skin soothing and moisturization, instantly makes your dried skin a more lively. 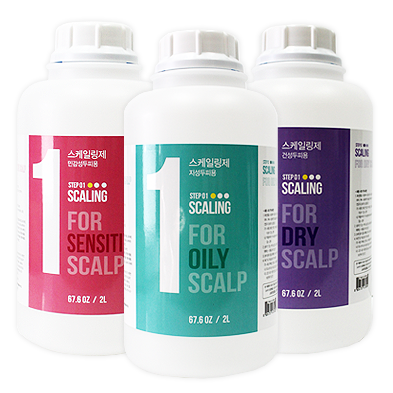 The products are divided into a product of dry, oily, and sensitive scalp according to a state of the scalp. With your pores opened by using the hair steam machine, evenly apply the product to your scalp with a thick cotton swab moistened with the product after taking about 7ml from this product container using the pipette, Scrub and wipe the product around the pores. About 7-8 times of wipes per a scalp region as if you make a circle.